Zephyr's new Titan pro-style hood is the ultimate workhorse in the kitchen. Featuring the groundbreaking new PowerWave™ blower technology, Titan includes a 750 CFM blower with the option to combine two blowers together to achieve 1,300 CFM - the most powerful internal blower on the market today. For more than 20 years, Zephyr has been transforming the kitchen through design, discovery, and care. The industry leader in kitchen ventilation returns as an exhibitor to the 2018 Architectural Digest (AD) Design Show in New York City from March 22nd - 25th at booth number 377. This year, Zephyr will showcase unexpected new products and technology, which include the most powerful pro-style hood on the market, small space solutions, and bold new finishes. "We're excited to return to New York for the AD Show, which always draws an excellent design crowd," says Luke Siow, Zephyr President. "This is a big year for us at Zephyr as we launch new technology and products that continue to elevate kitchen design; we're eager to receive feedback from this prestigious design community." Zephyr's new Titan pro-style hood is the ultimate workhorse in the kitchen. Featuring the groundbreaking new PowerWave™ blower technology, Titan includes a 750 CFM blower with the option to combine two blowers together to achieve 1,300 CFM - the most powerful internal blower on the market today. Its 3-phase motor design and unique aerodynamic blades improve performance with unparalleled quiet operation. Titan is available in five size options from 36-inches up to 60-inches with pro baffle filters and directional LED lighting. Available Spring 2018. Also on display at the AD Show is Zephyr's 63-inch Lux Island with a sleek integrated design that mounts directly into the ceiling above the island cooktop. Lux Island is available in stainless steel and white and features three tri-level LED light strips, Perimeter Aspiration, multiple blower options and a capacitive touch remote control. Its extended size and superior power make Lux Island the ultimate in-ceiling hood. The 24-inch Anzio is ideal for kitchens where space may not be a luxury with its low-profile, stainless steel chimney-style design. Anzio does not sacrifice on design or performance with BriteStrip™ LED Lighting, ICON Touch® Controls, and a 600 CFM blower. Black Stainless Steel continues to gain popularity in kitchen design and Zephyr responds to this trend with the introduction of Ravenna Island and Ombra Wall hoods. A sleek alternative to traditional stainless, Ravenna Island features a delicate curved smoke-gray glass canopy with an anti-smudge Titanium coating for extra durability and easy cleaning. Ombra is the perfect combination of form and function with Black Stainless Steel, capacitive touch controls, and optional hybrid baffle filters. The most affordable black stainless steel hood on the market, Ombra will make a bold statement in the kitchen without breaking the bank. Zephyr will also showcase its Limited Edition Okeanito in Black Mirror Stainless Steel designed by Fu-Tung Cheng. Founded by a family in 1997, San Francisco-based Zephyr continues to pioneer design and innovation to create unexpected experiences in the ventilation category and beyond. The company has challenged the perception of what ventilation means in kitchen design and created a new awareness of the importance of a high performing ventilation system. With acclaimed talent such as artistic visionary Fu-Tung Cheng, and industrial designer Robert Brunner, Zephyr is able to create cutting-edge residential range hoods unlike any other company. 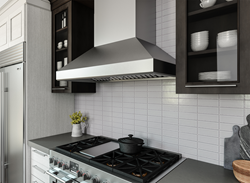 As a direct result of its commitment to elevating range hood design and technology, Zephyr is the recipient of several prestigious awards including Consumer Digest Best Buy Rating, Chicago Athenaeum Good Design, ADEX (Awards for Design Excellence), Appliance Design 'Excellence In Design' and the Architectural Products 'Product Innovation Award.' For more information, visit zephyronline.com.